This year I’ve made the Steggles pledge to #MakeTime for my loved ones by having more family meals together at the dining table! 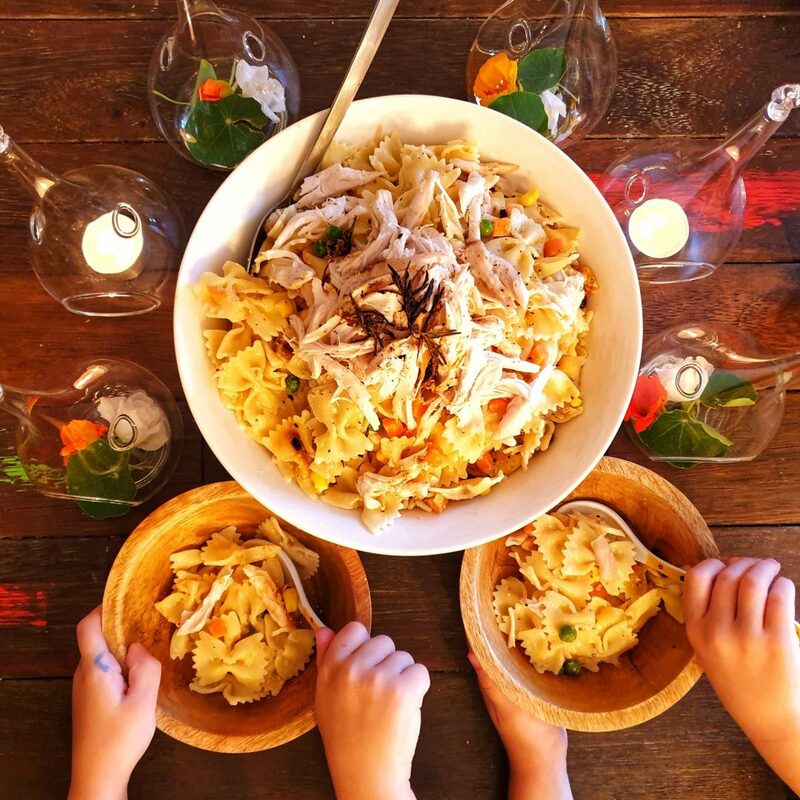 We get so caught up in routine and it can be so chaotic in the evenings that we usually have three different mealtimes and eating areas – the girls eating on the high chairs in the kitchen while I prepare dinner for everyone else, the boys eating at their kids table, then @mrtwinsandablog and I eating on the couch once the kids have gone to bed! Growing up, I remember eating at the table together with my family every night and it was a great way to connect and spend time as a family every day! I made a @Steggles roast chicken in the morning, had a busy day then quickly put together the pasta ingredients in the afternoon so we could eat dinner together. Preheat oven to 180 degrees. Place chicken in a roasting pan. Stuff garlic cloves + 4 sprigs rosemary in chicken cavity. Rub chicken with oil, taco seasoning rosemary (remove leaves from sprig). Cover with foil and bake for 1 hour 15 mins. Remove foil and bake for a further 15 minutes to brown the skin. Once cooled, shred half the chicken and stir together with pasta, frozen vegetables, sour cream and salt & pepper. You can use the whole chicken or half the chicken - I like to use the other half of the chicken for chicken sandwiches/pizza/toasties the next day!